Habit: Shrub, tree; dioecious or flowers bisexual and pistillate. Leaf: simple or compound, deciduous or evergreen, entire, toothed, or lobed. Inflorescence: panicle, terminal on short twigs, open to dense; flowers +- sessile. Flower: stamens 5; styles 3, free or +- fused. Fruit: spheric or +- flat, glabrous or glandular-hairy, generally +- red; pulp thin or thick, +- resinous. Unabridged Note: 2 species with pinnately compound leaves native to eastern North America, Utah, cultivated in California: Rhus glabra L., smooth sumac (petioles, young stems glabrous), Rhus typhina L., staghorn sumac (petioles, young stems densely hairy). Habit: Plant 2--10 m. Leaf: simple, evergreen; petiole 10--30 mm; blade 3--8 cm, 3--8 cm wide, wide-ovate to -elliptic, entire, +- leathery, generally folded along midrib, tip acute to acuminate. 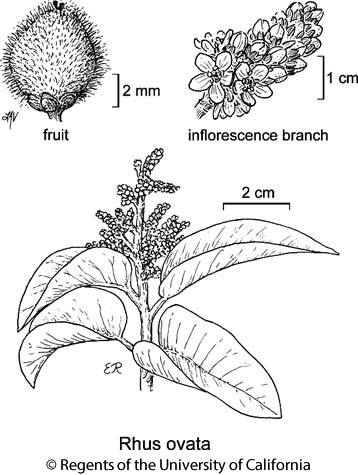 Inflorescence: branches stout; bractlets < 2 mm. Flower: sepals red, ciliate; petals white to +- pink. Fruit: 6--8 mm diam, glandular-hairy, +- red. Ecology: Canyons, generally s-facing slopes, chaparral; Elevation: < 1300 m. Bioregional Distribution: SW; Distribution Outside California: Arizona, Baja California. Flowering Time: Mar--May Note: Cult elsewhere. Hybridizes with Rhus integrifolia. Citation for this treatment: John M. Miller & Dieter H. Wilken 2012, Rhus ovata, in Jepson Flora Project (eds.) Jepson eFlora, http://ucjeps.berkeley.edu/eflora/eflora_display.php?tid=41191, accessed on April 19, 2019. SW; Markers link to CCH specimen records. Yellow markers indicate records that may provide evidence for eFlora range revision or may have georeferencing or identification issues. Purple markers indicate specimens collected from a garden, greenhouse, or other non-wild location.